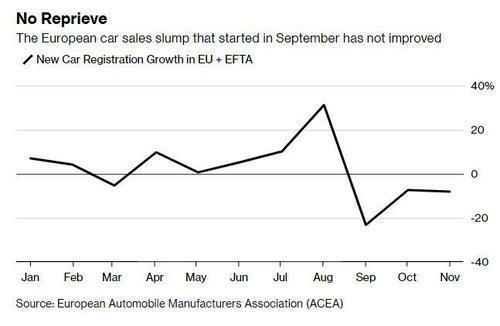 Automakers in Europe saw new car registrations plummet an ominous 8.1% in November according to ACEA data provided by Bloomberg. This is now the third month in a row that registrations have declined, as the overseas market - already in a precarious position – shows yet another indication of continuing weakness into 2019. Shares of automakers fell overnight after the November numbers hit the wire. The decline in November helped drag down year to date growth to just 0.6% in the European Union in the European Free Trade Association area. This downturn earlier this year began with the introduction of new emission standards across Europe. EY Consultancy had previously predicted that levels would pick up toward the end of the year this year, but now partner Peter Fuss believes that December is going to be negative also. He notes the fewer shopping days in the month as a convenient excuse for the tanking numbers. If December comes in similar to November, it could throw all of 2018 into negative territory. In order to keep pace with 2017, automakers would need to sell 1.05 million cars this month. If December registrations drop more than 8% – as the November ones did - the 1 million car mark will be impossible to hit. Contributing to the ugly numbers are the United Kingdom and Italy, two areas currently in the midst of both economic and political unrest. Both of these geographies fell in November, but Germany took the cake: down 9.9% for the month. And 2019 isn't shaping up to be a great year, either. BMW is already facing €1 billion in headwinds due to a slowing Chinese market and the Brexit chaos in the United Kingdom. The few potential signs of optimism for the coming year lie in whether or not a trade deal and a reduction of tariffs between China and the US is possible. Three days ago we reported that China is planning to cut tariffs on US-made cars to 15% from the current 40%. China boosted tariffs on US-made cars to 40% as part of a raft of retaliatory measures against the US imposed over the summer. While US automakers will undoubtedly benefit from the move, European automakers like Mercedes-Benz and BMW could be the biggest beneficiaries after both companies - which have sizable manufacturing operations in the US - warned about lower profits this year.